1. Suitable for pulpiness, paste-like mixture or powder raw materials. 2. Thermal sensitive raw materials having the requirement to dry at lower temperature. 3. Raw materials that are easy to oxidize or explode and have strong irritative or toxic. 1. Being adapted the heating way of jacket and inner stirring at the same time, its heat conducting area is large and its heat efficiency is high. 2. 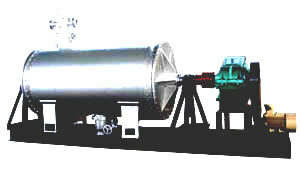 Being installed stirring in the machine, it makes raw material in the cylinder form the state of continuous circle inside the cylinder, so the uniformity to be heated of raw material is raised greatly .